January 26, 2017: A green technology program that’s second to none. January 26, 2017, Ali Emadi has set up a platform that is preparing the next paradigm shift in electrical power. 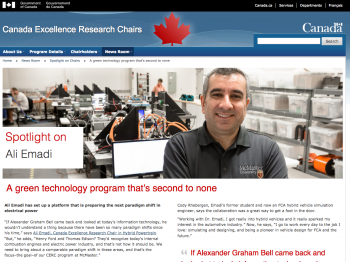 Read more about a green technology program that’s second to none as spotlighted by the The Canada Excellence Research Chair Program. June 10, 2015: Ontario Ministry of Research and Innovation has awarded $4.4M to McMaster University for the project Virtual Electric and Hybrid Electric Vehicle Powertrain and Integration Lab.